I suppose it goes without saying that I LOVE this pattern?! 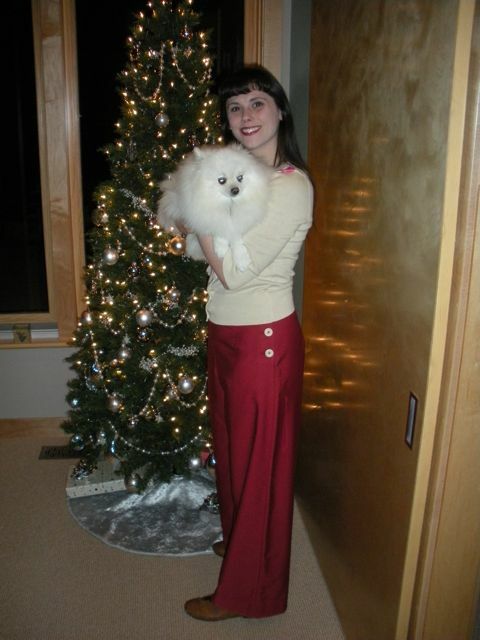 It’s December in Iowa and the weather is cold and gloomy, on its way to getting even colder and gloomier, and I could list the myriad of reasons skirts simply aren’t fun this time of year but I’ll just leave it at: pants are my go-to wardrobe staple when the temps dip, and I just can’t seem to bring myself to change that. So now that I’ve gotten over the fact that I’m simply not going to wear tights, I’m sewing up cute vintage trousers instead. These are a mid-weight dark denim, and I’ve been wearing them weekly! They wash and wear just like jeans. Although unfortunately they also shrink like jeans as well: the first time I washed them I had to let out the hem a whole 1-1/2″! 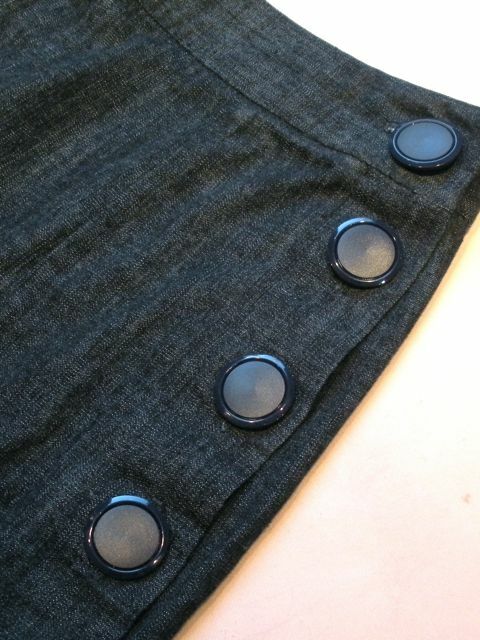 The first pair of these I inserted a zipper, but decided to try buttons on this round. They turned out great! Although they kind of like to come part way unbuttoned as I wear them. The pattern doesn’t call for it, but I added a lap to support the buttons. I finished this pair just in time for the Husband’s office party last night. 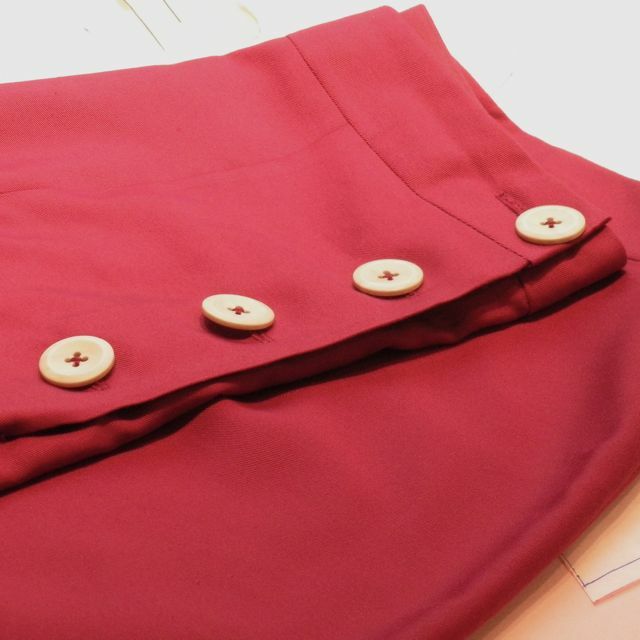 I used a red poly gabardine and they drape so nicely. Hope they end up being as easy to care for as the denim ones. Used some contrasting buttons and changed the direction of the buttonholes, so hopefully they won’t try to undress me as I’m wearing them like the others. 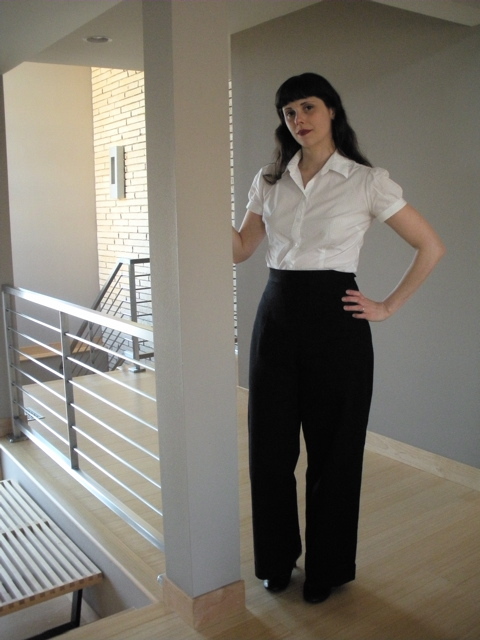 I have more of this gabardine in black and a sort of dark purpley-navish color, and originally thought I’d turn them out assembly line style, but have gotten kind of bored, lol! Will have to sew up some fun & quick projects before I get back to them. OK, here are the dresses. The older one’s was Simplicity 3329, no date, probably late 1950’s or early 1960’s. There is no reference to in on the internet to link a photo and I am not in a position to photograph it right now. The dress picture is actually copied from facebook from Easter. It goes into a v-backed neck and should have a bow at the CB which I left off. The little one’s was a 1940’s mail order pinafore style, not even sure where the pattern is at the moment. Both are from cotton voile pindotted swiss with broadcloth accents/binding. Both are fully lined. I completed the older one’s over 3 days of working and the inside is barely finished off, as quickly as I could do it. She would only wear it once or twice anyways, so I decided not to waste much time on it. The little one’s is better finished as she still wears dresses at the drop of the hat. These were fun to make, I wish I had more of the fabric for a top for me. It is so watercolor-pretty. For those who don’t know VPLL, it is the Vintage Pattern Lending Library. They have a membership program for discounted prices, but I’m not a member. I have tried two other patterns fom VPLL, with no success. This one, however, is a winner. 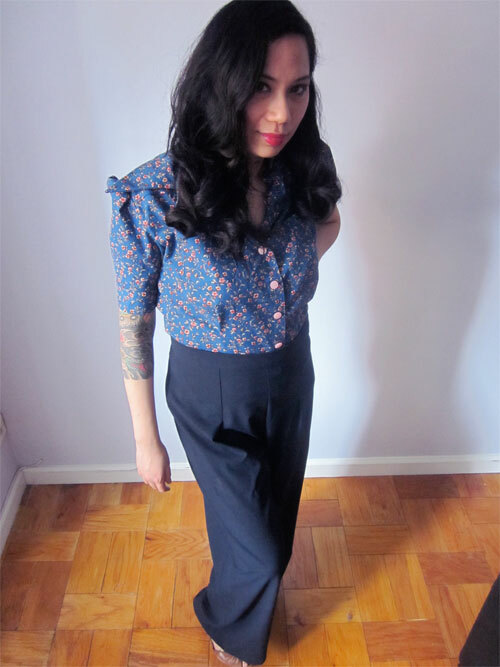 I’m always happy to find older patterns in plus sizes and 7451 is quite stylish. The original is a size 42, so I added 2 inches to the side seams. I also added a 1in FBA. I’ve recently come understand a major fitting issue is a high hip and raised the hip 0.5in. I could have come higher. The only design change I made was to omit the ruffles. I’m just not a ruffle gal. 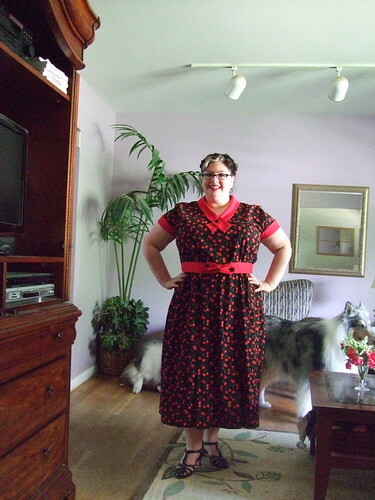 This is, so far, my favorite early 30’s dress that I’ve made and I think I’ll make it again, in a feedsack print. 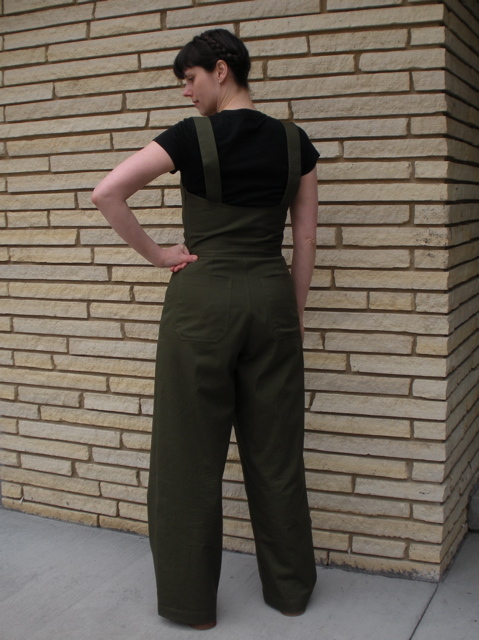 I started out using an indigo cotton twill as a muslin for the overalls, and ended up finishing them as a wearable pair of trousers (I didn’t have enough fabric to finish them as the overalls) because the fit was perfect and nothing really needed to be changed! 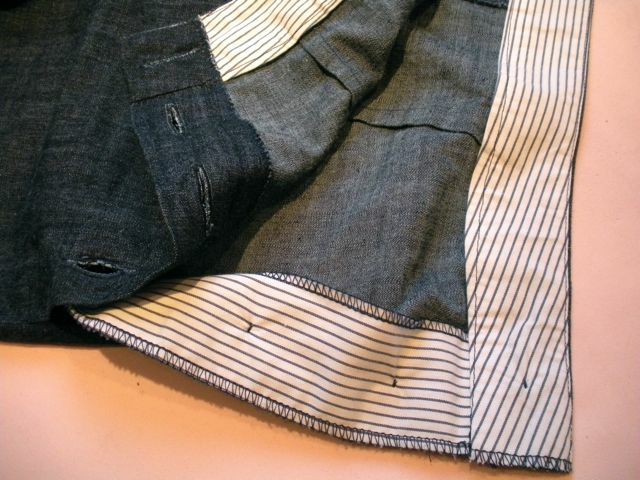 I did end up using my usual curved waistband and changed from a side button closure to a lapped zipper. But that was it! I want to sew a pair in every color! 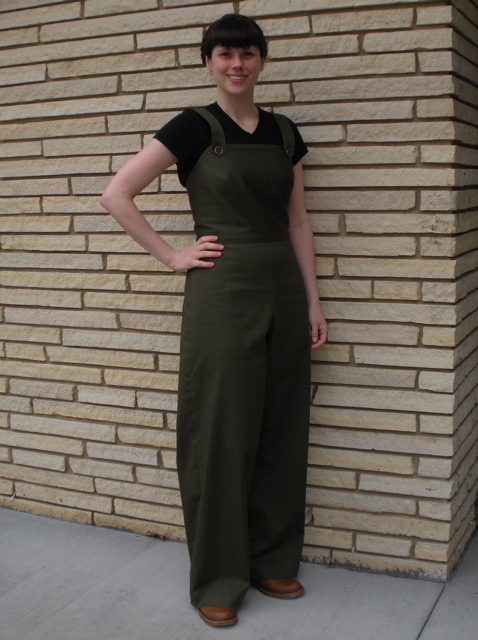 The overalls don’t have me quite as over the moon, but I still like them. Just a lot more fussing to get the fit right, and the fact that I lined the top and decided to put in an invisible zipper added a fair amount of hair pulling and teeth gnashing. Apparently I wasn’t able to solve ALL of the fit issues either – look at all those wrinkles along my back! All well, luckily I can’t see myself from the back. And maybe the fabulous pockets I added will distract from the wrinkles. I have some detail photos and a much more involved description of the construction process (as well as a lengthy monologue, and maybe TMI, as to why I don’t love hiking) over on my blog, Moxie Tonic. 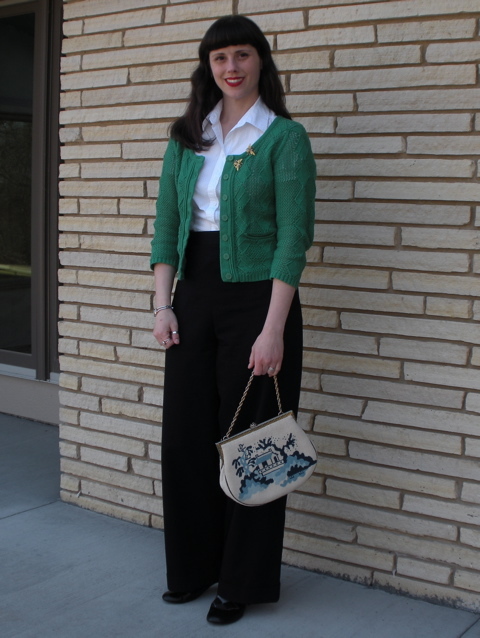 I recently finished these high-waisted trousers and blouse from Wearing History’s 1930s reproduction pattern. More details can be found on my blog.